Anthony Crolla takes on Vasyl Lomachenko in the early hours on Saturday 13th April and bookmaker BetVictor a huge 200/1 boost on Crolla to win! Fancy a major upset? Find here how to claim 200/1 for Crolla to beat Lomachenko! 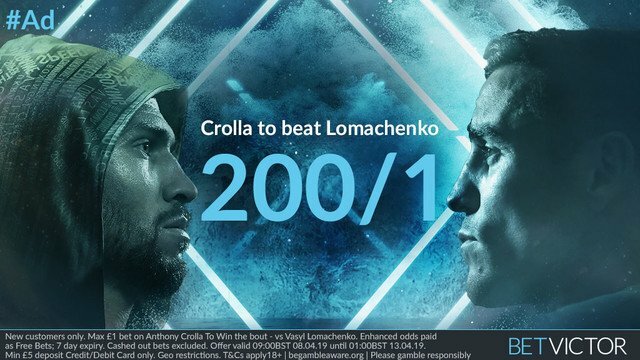 Get 200/1 Anthony Crolla to win vs Vasyl Lomachenko. Max bet £1! Crolla is a huge underdog with odds of 20/1 for him to win the fight in Los Angeles. Betvictor bookmaker has gone mad.. they are boosting the price of the Mancunian! Don't miss this promo! 2. Place a bet at the normal price on Anthony Crolla – to win the bout – vs Vasyl Lomachenko – Max £1. 3. If your bet wins, your bet will be paid out at the normal price and the extra amount credited as free bets. He impressed when securing a 12-round points win over Indonesian fighter Yordan (38-4-0) at the Manchester Arena last year, easing his way to a 116-112 win on all three scorecards. Prior to that, the Mancunian secured victories against Ricky Burns Edson Ramirez on the scorecards. Formerly known as Victor Chandler, BetVictor offer a vast range of sports betting markets and betting promotions. They have recently launched #PriceItUp, a Request A Bet service to create your own market by simply tweeting them your request. At BetVictor you can find some of the best odds across the world’s most popular leagues, including the Premier League. You can even watch all the live horse racing from the UK, Ireland, South Africa and the UAE at your fingertips. Offer expires 01:00BST on Saturday 13th April 2019. If Crolla wins, your bet will be paid at the normal price and will have the extra amount credited in Free Bets, to reflect the enhanced price of 200/1. Qualifying bets which are Cashed Out, or Partially Cashed Out do not count towards this promotion. Deposits made through Moneybookers (skrill), Neteller or PaySafe are excluded. "Get a HUGE 200/1 Anthony Crolla to beat Lomachenko at BetVictor!"